The trendiest are the ones who are most unafraid to stand out. The darker roots add more depth to this millennial hair color, and will definitely catch eyes everywhere you go. This beautifully colored reddish brown balayage looks amazing and brings out a smooth, healthy hair look for every girl out there! I did complete this look start to finish. Style, cut and color. I think this look is the perfect combination of blonde and brunette. I recommend this type of look to any brunette who wants to venture onto the blonde side, without losing their brunette hair completely. This cut is one of my favorites, as it’s simple but it serves its purpose. It’s the perfect length for those with finer hair, women who want to be able to toss their hair up or wear it down and it just looks healthy and up-kept. The style is a simple wave that doesn’t take much time at all – perfect for almost everyone’s crazy lifestyle. 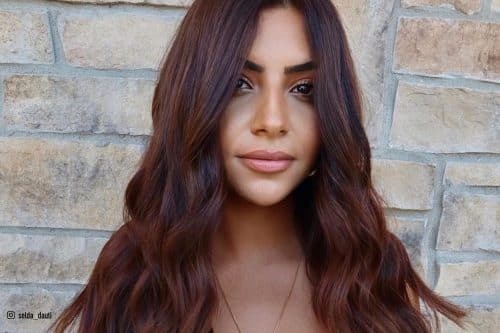 If you are a dark brown naturally or have the previous color on your hair, this look could take multiple salon sessions to achieve. It’s also important to use some protein products that your stylists recommend to you to keep the health of your hair after lightening! This look requires some upkeep but also gives some freedom to the guest. I tell my ladies to come back in 7 weeks for a trim and a toner. Then we can retouch the blonde when they want to, and that’s where the freedom comes into play. They can get the blonde retouched every 7 weeks or every 5 months, so I think it gives women some freedom with their hair. As far as this cut and style go, it’s very versatile. If you have a rounder face you want to keep the texturizing and layers to a minimum. If you have an oblong face you would want to consider adding some more layering into the cut. Other than that it’s up to you to play with! This look at my client, Sarah, has been nearly a year of trial and error in trying to achieve this exact color. Sarah’s most favorable tone is a bright bleach blonde that isn’t too yellow or too ashy. 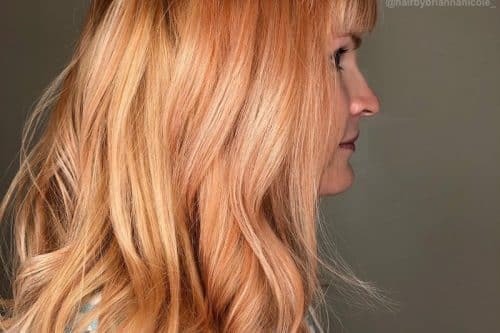 We tried many different formula combinations of warm and cool tones using Redken Shades EQ Gloss although none of the formulas turned out to be her desired bleach blonde tone. We then decided not to tone her hair at all and instead use Redken’s Blondage purple shampoo and conditioner and finish with Evo Fabuloso purple conditioner. Finally, we realized that keeping the raw natural warm blonde tones with some purple shampoo would give us this beautiful bright blonde. 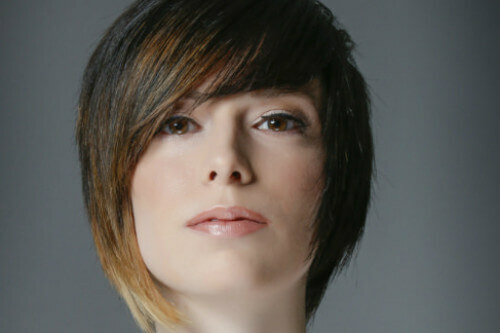 The haircut on Sarah is very simple in a way that she isn’t very particular other than having a U-shape at the ends which connect to her face-framing layers at the front. This style is inspired by all those beachy blonde waves posted on Instagram and other social media. Most hairstylists use either a wand or a curling iron to achieve that undone beachy wave while I prefer to use a flat iron. I have tried many different curling techniques using a flat iron to get the same result as a wand or curling iron. Sarah’s hair length and texture are perfect for achieving this look. This beachy, undone bleach blonde look works well with clients who have medium to coarse hair and no shorter than collar bone length. Having a bleachout requires a highly maintained upkeep of root touch ups, toners, and treatments. Depending on the face shape, a very texturized bang or face-framing layers would also look really good with this style. This trendy hairstyle is perfect for those who work in retail, restaurant/bar industry, and the fashion/modeling industry. This look is wearable in many lifestyles from your 9-5 job, to dinner and drinks in the city, and even a high pony or bun at the gym. A simple sea salt spray and some dry shampoo (if necessary) can make this beachy look last the whole day. Every other week a hair mask treatment (Redken’s Extreme Mega Mask) on a night it will keep this bleach blonde healthy and shiny. This is a modern smoky blonde with an edgy twist. My favorite thing about this look is how versatile it is. It’s suitable for any age group and can be worn smooth or with a little bit of texture to give an effortless, edgier look. For any client, right off the bat, I’d talk about maintenance. As with all blondes in the ash family, the tone of the blonde will gradually rinse out to a more neutral color. 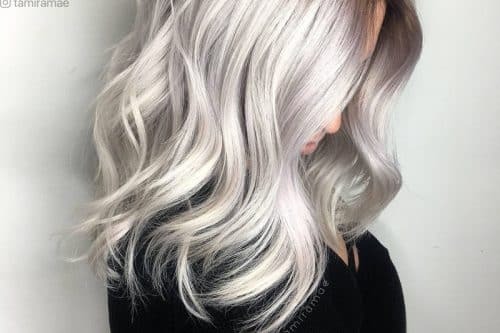 A purple shampoo is going to become your best friend to maintain a “cooler” tone. Loma Violet Shampoo is by far one of my favorite shampoos because it’s aloe-based as opposed to water. Aloe is much more hydrating for your hair and has many reparative properties which blonde hair definitely needs because of how many chemical processes it tends to go through. 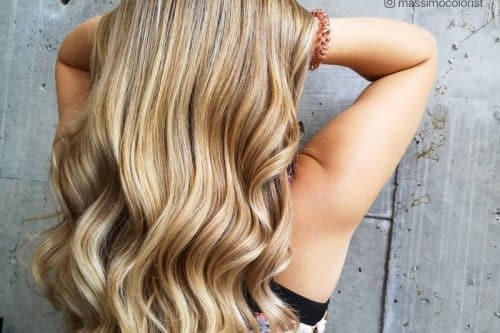 For any client potentially looking to make this color and cut their own, here are the types of hair that I believe are an ideal fit: natural dark blonde to light brown hair color, fine to medium textured hair, and healthy hair that it is good condition. 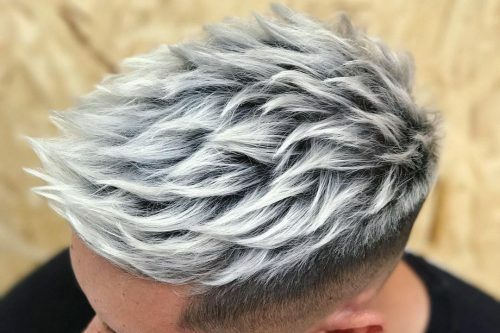 Who can rock this style? ANYONE! Because this look has a bit of natural root left out, it works well with most skin tones. The ideal face shape for this style would be either heart, round, or oval. Doing this cut on a square face shape is going to accentuate the jaw and box out the face. If the length was left a little bit longer, it would be very flattering on a square face shape. To create this smooth look, I did a basic blow dry using a large round brush and Eufora Smooth & Straightening Balm cocktailed with Eufora Curl’n Forming Cream. This duo of products gave me the smoothness, shine, and little bit of hold I needed to make the look last all day without getting frizzy or fluffing up (the client has naturally wavy hair). If you wanted a more tousled style, you could always go in with a medium-sized curling iron, spray with Eufora Full Effect dry texture spray, then comb through. This will create a soft, effortless beachy look. I love the simplicity of this look and the lived-in feel of the color, cut, and style. I love the fact that the blonde is set in a realistic tone not pushed too light where you can tell it’s manufactured. This color and style is for the modern women with a busy lifestyle. It’s effortless for the client when done right. The lived-in look maintains the health of your hair. It’s very important to have the right regime of maintenance. I like L’ANZA Healing Oil Shampoo and Conditioner to keep the hair healthy and shiny. I also like the L’ANZA Healing Oil to style and protect from heat. Lastly, all women should have a great dry shampoo to extend the life of their hair. 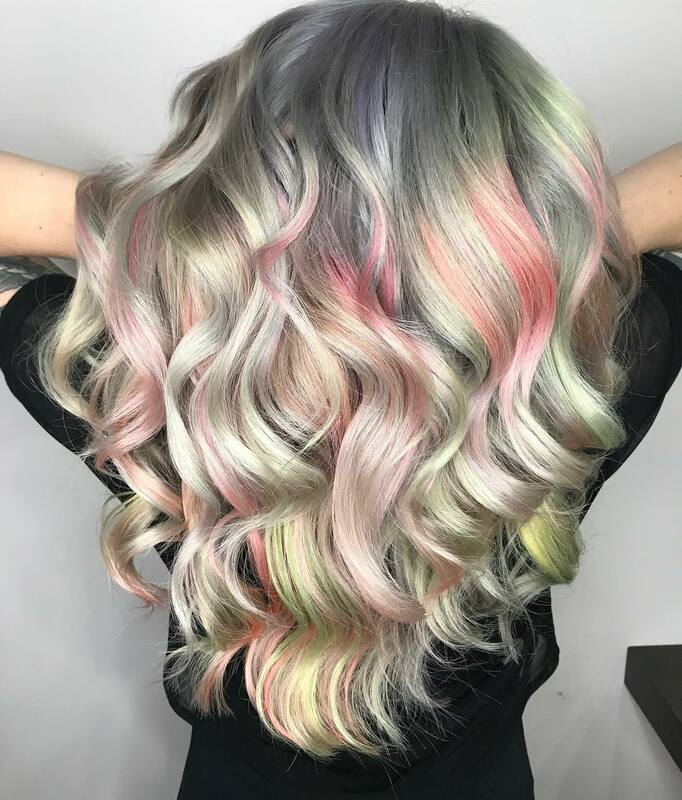 I love collaborations, and we were so excited to try a rainbow pastel look on one of our hair models. It was an experience not only creating a harmonious application but creating color melts on tape-in hair extensions as well. This look was an accomplishment and it’s the perfect example of two stylists working together and communicating throughout the application. Did you know that there are glow in the dark shades in this pastel rainbow look?! The biggest misconception that new guests have before venturing into a pastel vivid look is that it is low maintenance. Step one is to maintain a very light platinum blonde, and that means converting to an intense at-home haircare routine to keep your hair super healthy. Also, get ready to be best friends with your colorist because you will see them a lot. Pastels fade quickly, so make sure to heed advice from the professional that you are working with. All of that being said, the good news is that now we now have amazing at-home color conditioners like KeraColor and Overtone that help our clients have responsible fun with their color while keeping their hair healthy between appointments. Have some patience with the process. Do research to find the best stylist for you in your area, and please ask questions if you have any! I would describe this look as a modern, more muted take to the mermaid/rainbow trend that is sweeping the hair industry! My favorite part about this look is how versatile it is and how it looks just a little different every way you look at it. The rainbow peekaboos give that extra wow factor! If you’re looking for something more subtle, you can cover with the solid pink, creating many different looks from one hair color alone. You have to consider at least three things before going for a vivid hair service: patience, budget, and personality. These colors are not easy to achieve and they are not easy to take care of. They take real time and commitment and require special care. You will need to wash with only cool water (this is one of the biggest things for keeping your hair color vibrant) and use professional products such as a sulfate-free shampoo/conditioner. You cannot wash every day as the more you wash, the more it fades! These colors do not come fast or easy! A vivid hair color service can take anywhere from three to eight hours, depending on hair length, thickness, and the starting level of hair color. The darker your hair is, the longer and more expensive your appointment will be, but it does not stop there! These colors are not permanent and depending on hair type, hair porosity, and at home care, these colors can last anywhere from three weeks to three months! Be prepared to refresh that color. Colors like these NOT for the faint of heart! They are beautiful, but they are unnatural. If you are someone who does not enjoy getting your hair done every four to eight weeks, these colors are not for you. If you are someone who does not enjoy being the center of attention, these colors are not for you. Get ready because everyone everywhere will do a double take and approach you to ask questions about your vibrant hairdo! Overall, for anyone ready to break out of their comfort zone, vivid colors can be a fun (and addicting!) experience. I would describe this look as an edgy undercut pixie with bold blue tones to create peacock coloring. I love how the colors bring out the texture in the cut. Her hair is so dense and coarse that it can be challenging at times to see all the dimensions of the cut without a color to complement it. My favorite part of this look is how the color and design accentuate each other. For clients considering this look, please know it’s going to require frequent maintenance along with professional products. I recommend L’OREAL Série Expert Vitamino color shampoo and conditioner to maintain the longevity of the color. First, determine if this look is appropriate for your lifestyle and profession. The consult with your stylist to understand the best colors that complement your skin tone, face shape, and personality. To maintain this look, I recommend booking a color retouch two to three weeks after your initial visit because fantasy colors do not last very long. Schedule an appointment three weeks after that to decolorize the regrowth and refresh the color. 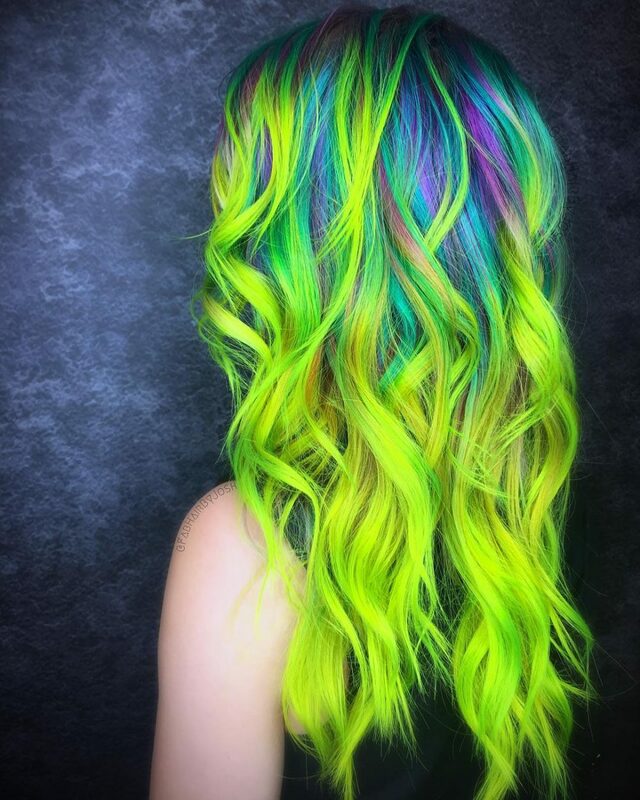 I would describe this look as a sunshine and rainbow root. My favorite thing about it is that I paired it with an unconventional contrasting color to blend it into. I don’t typically use purple and yellow together and haven’t seen it done too often with hair color. It’s something unique and happy! 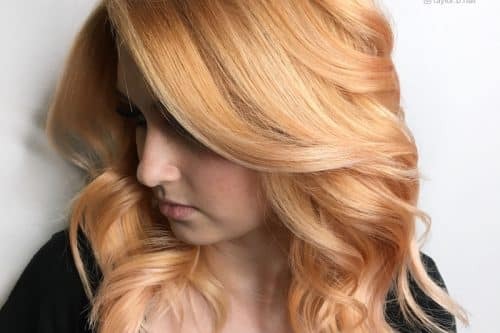 To preserve the vibrancy of these colors, clients will have to shampoo their hair only one to two times a week with a sulfate-free shampoo and cool water. Keeping heat tools on a medium setting and using heat protecting hair products before applying heat to the hair will also help preserve the color. You will need lots of dry shampoo to get you through those days you don’t shampoo! If you’re set on a having pink hair, for example, be open to different hues of pink in maybe cooler or warmer tones that are best suited for your skin tone. Most importantly, you have to have an amazing attitude and outlook on life to live up to this fun and creative hair! Remember that it makes you different and unique. I would describe this look as an injection of a modern beauty trend into the forever classic bob. By pairing this galactic color palette with such a defined and respected cut, this look is guaranteed to demand some level of art appreciation. It is truly a piece of art on its own. The best advice I have for a client wanting this service is to be prepared to be dirty!! This type of color can last up to 42 washes with a quality shampoo and conditioner. If you wash your hair four times a week, that’s 10 1/2 weeks of color longevity. It will fade, but Pulp Riot color fades true to tone so there is no fading to weird colors. A blue will always be a blue! Most of my clients say the fadeout is their favorite part. The best way for me to describe this look is a splash of purple or a purple-infused blonde. My favorite thing about this look is that it is still subtle enough that most clients who are new to fashion colors won’t feel overwhelmed. The best advice I can give to a client wanting this look is to make sure they are using professional products at home. The only negative with fashion colors is that they do tend to fade faster then normal colors, so this makes it very important to use a color-safe shampoo and conditioner. This look would be great on anyone that wants something fun, but subtle at the same time. I would describe this look as a bold statement piece. My favorite thing about it would be the difference in tones between the deep blue at the root and the neon lime green. If you are outgoing, love walking around with an awesome piece of art as your hair, and like to make a statement, then this look would be great for you! On darker hair, this look is more of a process to achieve than with blonde hair. 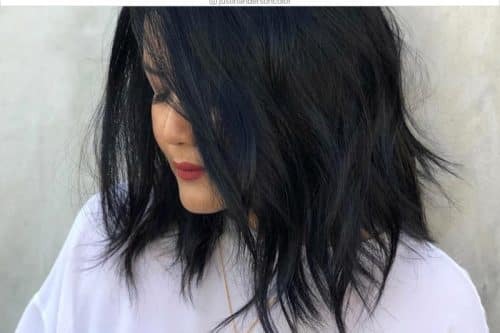 If you have dark hair and desire a look like this, just be patient with your colorist. 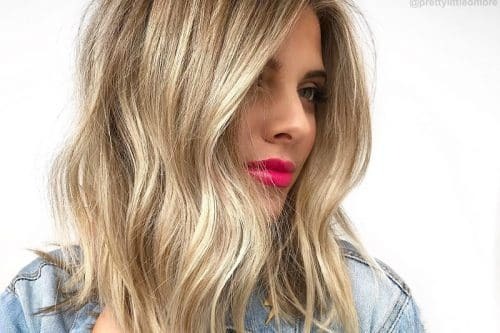 It is also is a fairly high maintenance color that typically fades within four to eight weeks, so if you’re someone that likes your hair to look fresh and consistent all the time, then this may be a look you want to skip. But if you like change, you will love the transformation in tone of your color as it fades! At home care is also very important with colors like this. You want to use a sulfate-free, color-safe shampoo and conditioner and wash with cool water no more than two to three times a week. Keeping heat styling to a minimum is also very important. Using frequent high heat can result in rapid fading. This look is very edgy, fun and vibrant, all while filled with depth and mystery. I say this because my inspiration was the water and when you look at water, there is always some sort of mystery and beauty to it! My favorite thing about it is first and foremost the person I did it on…my good friend! Secondly, it would have to be the intensity of the blue hues throughout. I definitely recommend making sure your stylist helps you maintain this color in the healthiest way possible! I used Joicos Color Intensity in the colors True Blue/Colbolt Blue/Peacock Green/Mermaid. I sent this client home with the product Viral or Gem Lites in the color Turquoise to help maintain the color. Cool water in the shower will keep your hair vibrant longer. 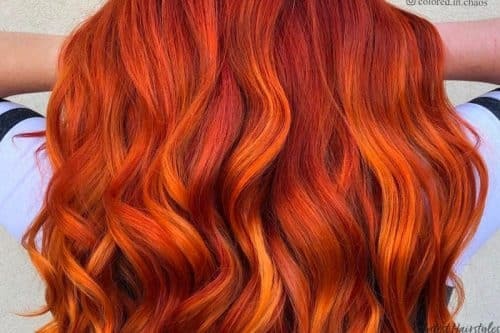 Stay away from hot temperatures with styling tools as that can also fade the hair color! I truly do believe that fashion colors are made for everyone. 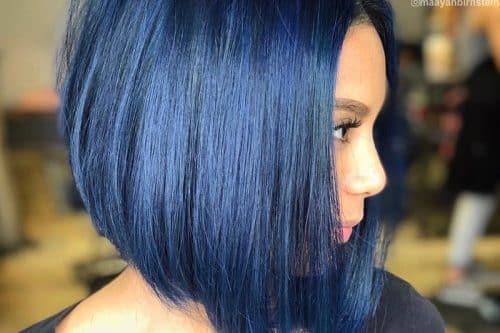 Now a whole head of blue might not be everyone’s cup of tea, but peekaboo highlights with fun fashion colors will work for everyone! I recently gave my mother purple lowlights and all of her hair is covering the purple, but when she wears it up, it’s visible and she loves it! I think it really just depends on your taste and look you’re going for as nowadays, fashion colors are much more accepted in the work place! I would describe this style as a tousled beach wave or a lived-in curl that’s fun and flirty. 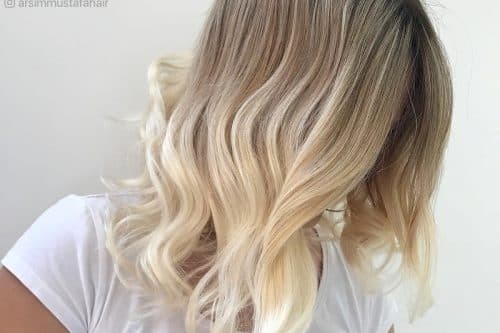 The is a playful, bright blonde balayage hair color with a shadowed root for a winter vibe on her color (blondes never really like being fully dark). My favorite thing about it would be the graduation of different purple tones through the sections. 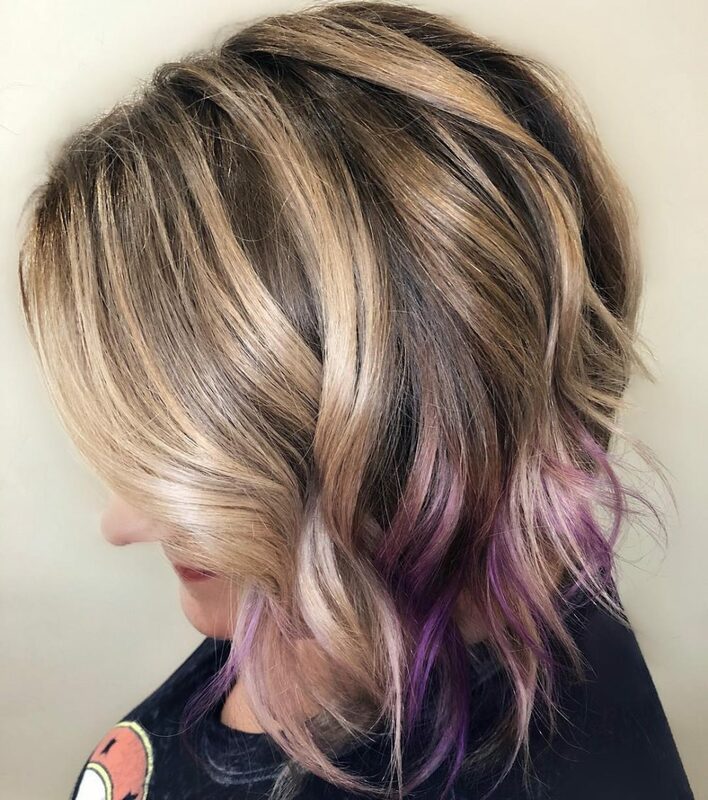 I used Pulp Riot to add this peekaboo purple to my client, and this fun color should last her at least 25 shampoos. It’s just enough edge for someone trying to have a little fun and still keep it somewhat conservative. This client has wavy hair that needs smoothing. For her, I suggest a smoothing lotion. Some of my favorites are Smooth.Again. by Kevin Murphy, Supershine Moisturizing cream by Oribe, and Relaxing Moisturizing Fluid by Davines. These products reduce frizz while protecting against heat. After her blow dry. I used a GHD flat iron and twisted the hair one full turn, then pulled out until about an inch from the end to create a tousled, natural look. I am a huge fan of texture, so my signature finishing routine is most likely a spray. Currently, I use Kevin Murphy Bedroom.Hair. It’s a lightweight flexible texturizing hairspray. 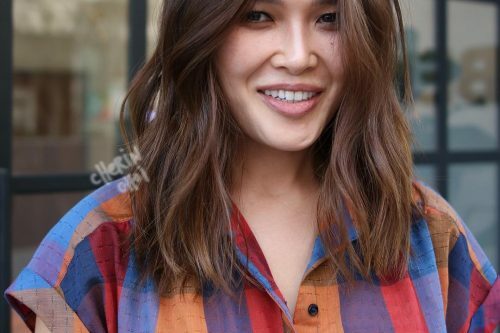 This style is pretty versatile and looks great straight or wavy. This can be worn on fine hair because adding a tousled wave will make the hair look fuller instead of flat. Medium density and texture is ideal for the style. In my opinion, if this is styled from start to finish with the right product, it can last a few days with maybe a light touch up. 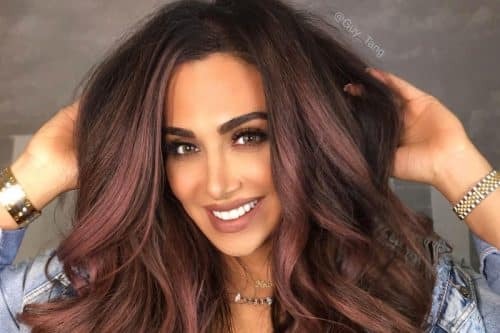 On thicker hair, the purple would need different placement or a larger section to make sure it shows up well, but it is still very easy to accomplish. I made sure the blonde was a neutral tone so it didn’t clash with the purple. It’s all about preference, but I think it’s more flattering when tones complement each other. This overall look is ideal for the woman that always likes to change her hair. Fashion colors are semi-permanent so there is no commitment. This look could be appealing to a stay home mom that defines herself through her hair, or women who are more conservative but fun. The cut and style is great for business women in marketing or advertising that are on the go and can do some light iron work and texture spray before they run out the door. This “not too finished” look is a big request this year. Women want to look how they feel confident, fun, beautiful and youthful. Fun, trendy and vibrant are the words that come to mind with this look! My favorite thing about it is that it is so unique. As fashion colors are becoming more popular and seen day to day, common requests are purples and reds and sometimes pinks, but green isn’t something I️ get to do often. That’s why this was so much fun to create! I️ just love the vibrancy. For this color, I used all Pulp Riot products from lightener to color. These colors require a little more upkeep and care than most colors. A sulfate-free shampoo is a must and I recommend Kenra Color Charge to all my clients! A good heat protectant is also needed for the blowout and styling. I️ use Design Me Powder Dry before blow drying and Kenra Heat Block Spray 22 before any hot tool. I also recommend minimal washing and cool water to keep color vibrant! Clients looking to get this type of color need to be fully prepared for the upkeep and proper care before jumping in. Usually, retouches are more often and more time is spent caring for the color at home to keep it looking fresh. Most of these colors need to go on fairly light hair, and not everyone will always be able to get light enough. That is something I discuss individually with each client, as well as what color options would work best for their hair type and condition. I️ always like to be up front with clients wanting to do fashion colors that it really is a commitment if you want to make it last. While not for everyone, these colors are so fun and are truly where my heart is when it comes to coloring! I would describe this is more of a punk rock look with a Betty Bang! Half-and-half hair is a lot of fun because you get to have two different colors on your head. My favorite thing about it is pretty much everything! The half-and-half purple, black and Betty Bangs are all things I love. You must be pre-lighten to achieve this look. I used Pulp Riot hair color for the purple, mixing Smoke and Velvet together. I always mix with Olaplex to ensure that the hair stays strong. It also helps the color molecule attach to the hair to stay healthy and strong and keep it from breaking. For the black, I used Color Insider 1n, foiling it in and applying the purple color around it. I recommend this look for someone who wants purple hair, someone who doesn’t care what others think, someone with a strong personality, and anyone who likes bangs. Fashion colors are not easy to maintain and take a lot of work. They also take a lot of time in the salon, so be prepared to pay top dollar for something like this because it is not easy and it takes anywhere from three to five hours. Proper at-home care is also expected with color refreshing shampoos and conditioners, as well as Olaplex color bombs. This client has very strong and thick gray hair. She is in her 40’s and is very pale. I feel anyone could wear this look as long as they’re comfortable with it. 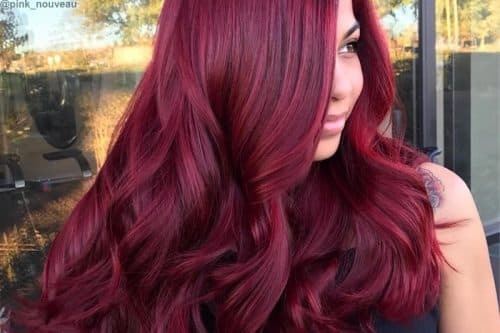 This is a light and fun way to change your color up without commitment. Hair fades nicely when toned with pastel lavender colors. My favorite thing about this look is that it is highly dimensional with dark hair. I love the soft contrast. This was achieved with babylights small enough to lift up and tone over a soft pastel tone. The number one product I recommend is a very strong purple shampoo and conditioner. This helps keep the color cool as it’s fading. If you want to hold on to it a little longer, you can buy the one that has more customized colors closest to yours. Or you can come into the salon and keep trying new colors to keep it looking fresh! Other products for styling include setting lotions and texturizing sprays. I recommend this look for a client with a job that allows their employees to be expressive or any client who wants to try a fun color. Pastels are the way to go! I recommend it on softer skin tones and darker hair. The dimension stands out and complements each other and the cool color goes well with cooler skin tones. 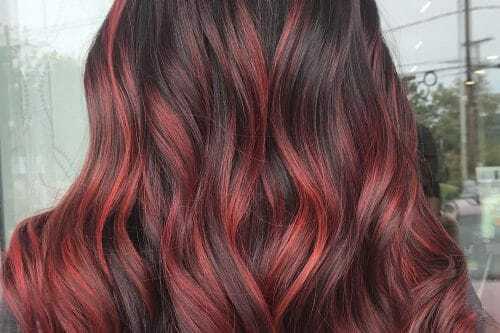 This hair color is for the women who want to be trendsetters and not just play it safe. 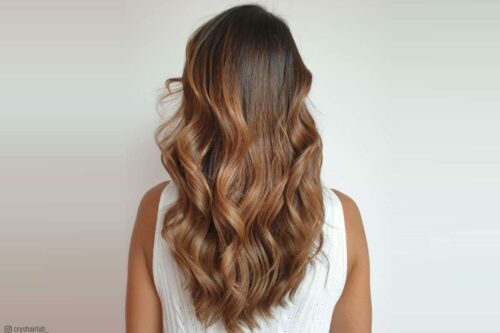 The ombre style doesn’t use your conventional color schemes but blended silver color and rich natural brunette hair tones to create a dazzling hairstyle from top to bottom. 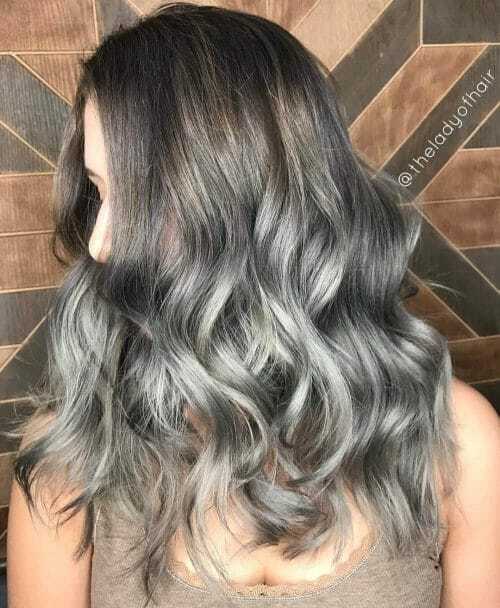 The silver is perfectly done at the bottom to give it a fiery, smoky look that is hard to achieve with darker color palettes. Exceptionally finished hair color like this one the goal of any salon visit. I am living for the 2019 color pf the year! Soft-tones that you brings a wide range of hairstyles to play with.